00:28 this episode is brought to you by the five for life planner or if it makes you feel better, the five for life planner/journal. Right? So you can go right now to fiveforlifeplanner.com and download a full PDF version of the five for life planner/Journal. Yeah, and the s five for life planner is a great tool to get you going and check off everyday these daily actions. One MOVE, two learn, three share, four give and five let go. Five daily actions, all proven to increase longevity and improve overall quality of life and happiness. Yeah, so you can live happier longer. Yeah. Check it out. Fiveforlifeplanner.com for your free PDF of the five for life planner. 01:18 Hey Angela. Hey Molly, how are you today? Not too bad. Yourself? Excellent. Happy International Women’s Day. And back at Ya. Yeah. If we are recording a little unusual, not on a Tuesday for us, but uh, seems appropriate, especially given our guest today. For sure. 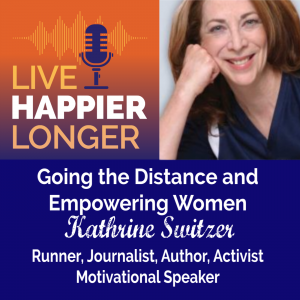 01:37 We have been very fortunate lately talking to some incredibly inspiring people and Kathrine Switzer who is joining us today is no exception. Yeah, she is. She is definitely up there on the inspiring level. Yes, for sure. She is an athlete, an author, a public speaker, broadcaster, journalists, philanthropists and trailblazer for women. Absolutely. The very first woman to run in the Boston marathon. Yes, indeed. Back in 1967 and then ran it again in 2017 50 years later. Yeah. Again, something no one else has ever done and no woman has ever done. Without further ado, here is our conversation with Katherine Switzer. 02:21 Hey, Kathrine, Hi Kathrine. 02:23 Hey Molly. Hey Angela. How are you? Oh, we are doing well. Yeah, we’re great. It’s a little, I got to say it’s a little cloudy, a little gray here and cold in Oregon, but you know, it’s all right. It’s, it’s winter or I guess it’s almost spring. It’s supposed to be Spring, but it’s not yet. 02:39 I’m sending you greetings from New Zealand where it is sunny, absolutely beautiful. And we’re moving into late on autumn. Isn’t that amazing? 02:46 Yeah, it is. It’s, it’s the upside down and I love that. And I, New Zealand is on like the top of my bucket list for sure. I really want to get there. Well, we just gave a brief introduction. I mean, feel like I could have, there’s a quite a list. Yes, exactly. Historical list of accomplishments that, that you can say you not only were your personal accomplishments, but then things that you’ve done that have definitely improved the course of women and female athletes in your life. So let’s start back at the beginning. If we can just start at the start. And I’ve loved the fact that you were, I mean, you were at a very young age wanting to be a runner or wanting to run or wanting to be an athlete. 03:38 You know, I was 12 years old when my father said, um, you should run a mile a day if you want to make that field hockey team in your high school. And I was a skinny little girl who was insecure about going into a big high school. It was only 12. I was a year ahead of myself or a year ahead of everybody else or whatever. And um, prepubescent. And, um, I was going into the adult world and I think my father saw that I need something to hang on to. And he said, run a mile a day, you’ll be really good player. And in fact, I ran this mile a day and I did make the team. I became a very good player. But the point is, is this mile day gave me a sense of my own body and my own capability, but and a sense of empowerment and fearlessness that stayed with me through just about everything I did. And, and I, I’ll never forget, you know, when, when I was experiencing all these new, um, really assaults on my, my mind and, and, uh, I, I really had then, this victory under my belt every day from running that nobody could take away from me. That was so powerful and it stayed with me my whole life and it was felt like magic then. And I mean here I am, I’m talking to you now. I’m 72 and it’s still magic. 04:49 Isn’t that fantastic? It’s fantastic. It’s, it’s, and you know, I think that we’ve, we’ve talked a lot on our podcast about habits and about atomic habits and this, this idea that it’s those consistent activities that you do over time that really define your, your life and define who you become. So you started at age 12 maybe not with the goal of being a marathon runner, but that’s who you became because you took that consistent action day you know, time and time and time again. 05:23 Absolutely. And I mean if, if for instance, the other things had been different. For instance, if women’s hockey had been in the Olympic Games, maybe aspired for something more, but I was using the running to stay in shape for the hockey. But then it was actually the running I love the most. And then as time went on, I realized I wasn’t going to have a field hockey team because in the, or in the early sixties, we didn’t have those options. And when I went to Syracuse University to study journalism, I went there to write sports because, um, uh, I knew that at least if I could write something that I’m close to, it would be like a lifelong love and like I could always run by myself. But it was there that I, I, um, started working out with a men’s cross country team, which was very unusual. They were wonderful guys, totally welcoming as, I mean, this wouldn’t have happened in football, lacrosse. And the assistant coach who was out there took me under his wing and helped me with my running and we started running longer and longer and he was an ex marathon and I fell in love with the idea of going forever. I couldn’t go fast, but it felt like I could go forever. 06:34 Yeah, that’s, and I think that’s, that’s the amazing thing about it. You know, back then there wasn’t the opportunity for women, but here you were and you were totally supported by the men that you were running with. So it was almost like why was there no all that for women because the men supported it, you know, you were doing it with them and they were, you know, they were quite happy for you to be there. 07:08 You know, I really think that running is different. I think running is a sport that is a egalitarian, inclusive, um, motivational. We don’t care about your gender or your income or your race or religion. And, um, I think these guys saw a young girl out there who was, um, uh, willing to try and they were very, very, very supportive of that. Now, my husband, who’s been a lifelong runner and was a world class runner for both England and for New Zealand, said, are you kidding? If a dishy girl, like you had showed up in shorts who would’ve been awesome, but be that as it may, they were motivational and we’re never patronizing, but it was Arnie, the volunteer coach who actually was a university mailman who ignited me to running a long and he realized that he had 50 couldn’t keep up with the boys and the cross country team anymore and I could never as a female, but we realized that I could outrun them in distance because the longer it got, the better I got. 08:05 And the more of the closer we got some food go out for 15 mile run, I was right with them. And so this was a very interesting awakening, which we’re now discovering in terms of females, is that we have capability and endurance and stamina that men don’t have. And this is changing the face of our sport in many ways. And giving women the thrill of going out and doing marathons and ultras winning or being able just to go the distance and feel that same sense of victory and worthiness. And that is one reason why right now in the United States, 58% of all runners are women. 08:42 Yeah. I just read that. It’s amazing. 08:45 Yeah. And they do it well just by virtue of being female. And I, I joke, I say, hey listen ladies, you know, you’ve got a fuel source called fat and you hate it, but it works. 08:59 Although I say everybody, so you’re, you’re quite slender. And I think people that run long distances and we just, we recently interviewed, I don’t know if you’ve ever heard of her, familiar with Cherie Gruenfeld. She’s uh, an iron man champion a world and, and a is turning 75 this year. So she is an amazing, again, like you and amazing, um, long distance athlete. And she said the same thing. Like she never was in it. She could never do the, those short distances. The, you know, the, the, the speed races from the very beginning, it was long distance for her. 09:36 She just had one pace. She would, she would run it for 13 miles or she would run it for 26. That was the piece. Yeah. 09:43 And what, what’s great is when you see women doing it for like 200 miles woman in, in the Scotland, England and England and Scotland. I think that’s how long the run was. And she won over great men champions by something like 13 hours. Wow. And they said, well, you know, how did you, where did you sleep? I mean, you use use such sleep deprivation and, and, and distance and cold and everything. She said, listen, she stopped, she stopped at the aid stations where they get water and juice and stuff like that. And she was nursing her baby. Okay. Wow. You said, listen, if you’ve had a baby, you’re up all night, you’re expert in sleep deprivation, you’re fat fuel source helps you. Um, and, and you know, you, you have all this, this incredible strength from, from just having delivered. So we are now discovering, I mean, I know this program was about age. Okay. But we’re also discovering a whole new thing with women’s capabilities that, that nature has provided us, but we’ve never had in the past to sports opportunities to deliver and take advantage or create those opportunities using our unique abilities. The reason being, Angela, that when you said, why didn’t we have those opportunities before? Well, first of all, you know, people, people didn’t have the money or the leisure and, and um, and women didn’t have frankly birth control that either they had a lot of children, they had to manage your home. They didn’t have washing machines, they didn’t have refrigeration. So they didn’t have time for sports. 11:15 They were so busy. Yeah. Yeah. 11:17 And men too for the most part. So, so now, you know, the world is changing and now it’s opening up many, many new, uh, physical possibilities, but also quite wondrous things that we’re discovering better. Aging is one of the greatest though. I mean, is, is how we age and how we can hopefully age better, um, more wisely, more optimistically and um, and, and, um, and healthily. 11:45 Yeah. Without question. That’s what we, as, you know, that’s what we, we advocate all the time is that we are the people that control that. You know, we have the ways and the abilities to do that. I’m not just through medicine, but it’s really more about our, uh, the optimistic mindset, you know, and how we can tell you continually grow as we age. It’s not a, it’s, and I think you’re obviously are a vivid example of the fact that getting older doesn’t mean that it’s just a slow downhill. 12:14 You can keep improving and keep impacting people and keep impacting lives. 12:18 Yeah. You guys asked about the past, I’m going to quickly tell that the Boston store, yeah. Aging story right at the end of it, which is I think everybody knows the story. We’ve seen the pictures on the Internet, uh, a million times, but, um, because my coach is inspired me so much and he had been an ex-marathon runner, um, when I showed him a practice that I can run the marathon distance, which he didn’t believe any woman could. Uh, when I did it, he was so impressed and admiring of me. He helped me register for the Boston Marathon, insisting I had to do it, officially sent the entry for man because I signed my name K V Switzer. They, they thought that this was from a man. So I was given a bib, showed up at the race. The guys were wonderful. It was snowing and sleeting. The officials obviously couldn’t tell me and my sweatsuit from all the guys and their sweatsuits and a mile and a half into the race, the race director, uh, saw that I was a woman in his race wearing a bib number, lost his temper, jumped off press truck, chased me down the street, grab me and screamed, get the hell out of my race and give me those big numbers, tried to pull him off of me. 13:24 I’m a big tussle in sued. Okay. And my boyfriend who was running with me, who happened to be a 235 pounds Football Player, which is another story. But anyway, bounce official out of the race instead. And I went on to finish making the decision to finish was probably the most important decision I ever made in my life. And I think I could make that decision at 20, because I had had, you know, uh, you know, a mile or three or 10 a day of running behind me that made me feel strong. And I said, I can’t stop. No matter what, I have to do this for other women. And, and of course, you know, in the course of a marathon, you, you get a lot of ideas. And I knew by the time I finished the race that, that my life was gonna change and I was going to need to create opportunities, which I did. 14:11 But one of the journalists, angry journalists at the finish line said to me, this is a one shot deal, right? I mean, you’re not going to run a marathon anymore. You’re right. And I just looked at him and I said, you know what? I mean, I must’ve been really feisty at 20. 14:27 I think the fact that you had registered for the Boston marathon would only men were registering, I would say you are feisty. Yeah. 14:35 I, um, I said to him, you know, someday you’re going to read about a little old lady who’s 80 years old who’s dropped dead while running in central park. That’s going to be me. I said, I am running for the rest of my life. And, um, I was just so I got to tell you, I have never had any doubt that I would always be running and then. 15:03 I don’t think you’re going to be dropping dead at 80. I don’t think that’s happening. 15:18 that now we’re talking a little bit more about realistic. I think that, um, you know, and I, and I, I believe that you will be running and continued that journey from now until then. So, and thank you for sharing that. Uh, that brief recap of some, a very monumental historical events for not only you, but for women in general. It’s something that looking back in hindsight, of course, we can see very clearly that it was the, the first of something of a very long journey to come in terms of, and take us through a little bit how, how that did, how did that decision and how it did impact your life. And then as we moved towards 1984, you know, the women’s marathon became the first time that women’s had a marathon event in the La Olympics. 16:11 Yes. You know, first of all, right after I finished the race, I mean I was beloved by many people but also hated by a lot of people. So you know, you’re pilloried, you know, um, but, but you’re also a celebrity in some ways. And, uh, I threw away the hate mail, kept the good mail and there were plenty of women who wrote to say, Hey, if you would run in this race, I’d run with you. Um, but we had to really dig down and, um, uh, legislate. It took us five years, but we finally got official at the Boston Marathon, that angry old official and I became best of friends. So that’s a nice, that’s awesome. Again, another story, but then I began turning my sights on what would, what would make women’s running really happen because too many women were still afraid to take that first step. 17:00 They thought the marathon was just really out there. And um, I’ve got the opportunity to create with a Fred Lebow who created the New York city marathon and Nina Cusick, the first ever women’s road race in new, and we did it in New York in Central Park and 78 women showed up, was called the crazy legs mini marathon named after them. Um, it was huge. The success, the media was, was massive. Well, we, 78 women was considered, you know, 5,000 now. Right. Then the light bulb went on. I realized if we could get into the Olympic Games, if we could prove to the International Olympic Committee, the IOC that, that women could run and deserve to run these longer events, but I will have to demonstrate to them the event. And I went, I wrote a proposal, big business proposal, and I took it to Avon cosmetics. Then the largest cosmetics company in the world and showed them a program I wanted to do globally because they were a multinational of organizing these races around the world and then proving to the Olympic Committee that we had the international representation and the numbers and the performances. 18:13 Believe it or not, Avon love the proposal and hired me. It was one of those moments like, oh my God, I can’t believe this has happened to me. I really had to dig down. I had at that point then to give up my own competitive running. I’ve done it well and won the New York City Marathon. By that time I’d posted a two 51 in Boston, which was great. Then still pretty good proving that if I could do it, anybody can do it. Cause I’m not a talented person. I work really hard but I’m not talented. And, um, we organized a series of races and in five years we were already in 27 countries and, um, and now eat the program still exist in some countries, but I mean we’ve had, you know, over 400 races, over a million women in 27 countries. But we had the data now to present to the IOC. 19:00 The IOC still said, Oh, you know, we’re really worried about this, the, the medical evidence, you know, that, that, you know, your uterus is going to fall out and you’re going to, and, and then what we did is we got some really good doctors who were runners who helps support us and showed, in fact, quite surprisingly, that it’s not the shot put or the hundred meters that women are good at. It’s going to be the longer distance. The marathon in particular, they’re naturally suited for quite the contrary to what everybody felt. So the IOC voted this in, um, with only one dissenting vote for the 1984 Olympic Games. And to me that moment when Joan Benoit Samuelson came into the Olympic stadium, you know, to, to the screams and cheers and 90,000 people was, uh, one of the greatest moments in women’s history, not US, women’s history, not because of her performance was just stellar, not because of the crowd and not because of the attention, it was because it was broadcast to like 2 billion people. So everybody around the world could see what was it about. 20:12 And were you not, were you, were you not commentating on that? 20:17 I was. I had done commentary before, but it was my first big Gig for the Olympic Games and really opened a new career in television broadcasts. 20:24 How did, how did you feel watching that? Did you just get that sense of, I was part of that! I want to and I, I would have been in tears. I just watched the clip this morning of a rerun , um, on and we were just chit chatting about this, I have a vague recollection of the Marathon. And I was like, I was still young when it happened, um, but have a vague recollection of it. But when I was watching the, like the rerun and her coming through the tunnel and then the stadium and the place erupted, you know, US, it was in the US, it was a US athlete. It was the first woman winning the first marathon. I mean, it was just like, there were so many firsts. I mean, it was just unbelievable. And I like was just sitting tearing up watching it. It was amazing. You must have felt so proud of, you know, being that first woman who had just started to push the boundaries and, here you are, watching this happens. 21:30 Yes, I did. But you know, as a TV commentator, first of all, you know, television is such, such a mixed bag. Um, you, you have to stay very, very calm and not, uh, be sentimental, not be judgmental, not emotional. 21:47 You got to be neutral especially in the Olympics. You got to represent all countries. Yeah. 21:53 Well, and in fact, I was thrilled for Joan Benoit. I mean, you know, she was a friend and I loved her and she, she, she ran one of the most, uh, courageous races and I was absolutely convinced that Ingrid Kristiansen was probably going to win that race. So, uh, and, and so I gave equal time to everybody. I if, if in fact Greta Waitz so decided not to let Joan go and stay with her. It might’ve been a different ballgame, and everybody would’ve settled Greta Waitz around the greatest race in the world. But Joan grabbed the race by the throat and very courageously won, if she has been crashed and burned, they’d say, aw, she went out too fast. Too Bad. History is amazing. Uh, and I think if you want to know the truth on that day, I think Joan Benoit Samuelson was unbeatable. I’m seeing her in action for many years, and when Joanie digs in that she just is going to do it. Yeah. 22:51 Yeah. I, like I said, yes, I wouldn’t be a good, I would be crying. So it would’ve been, I would’ve been not the right commentator. It’s good that you were even the fact that it was Joan the won it, the fact that you were watching a woman win an Olympic medal for the marathon, that in and of itself. It must have been unbelievable. 23:13 It was, it was really good. Uh, yes. So, so that was a moment to me that was good. It was chinked going to change women’s history and in many, many ways it did it and opened up the, the, the really the floodgates for, for women to run, but more where people in isolated countries where women have no opportunities whatsoever, realized that women could do the unimaginable. So that was, that was to me is that the little crack that pushed open the door, kind of like when we saw in 2012 in London, we saw the woman from Saudi Arabia run. And um, everybody said, well, she wasn’t really a Saudi. She really lives in America. She didn’t know it. Sorry. She was on the track. She was who she was representing. You ran and I’m sorry, she pushed that doorway open. So those are moments that are unforgettable. And, um, we look back on those in a hundred years, maybe not a hundred, somebody will and say, wow, you know, look at the progress. 25:09 There are two things, um, uh, Angela that I bring up about that. That’s all true and that’s wonderful, but we still have such a long ways to go, let’s say with like professional sports. Okay. And that’s such a narrow part of our society, but yet it really, um, it casts a vision of other women around the world. So, so what, what I despair at is women themselves not supporting professional sports. So you think nothing about in your family about buying a season. Football tickets or baseball ticket. Okay. For the two professional team, are they college team? That’s the university team that may be in your area. But do they do that for the women’s? And I said that to a couple of friends of mine. I said, what are we going to do about getting um, more attendance at these games? I said, when was the last time you bought a ticket? 25:59 You got to go. 26:00 Oh my God, I didn’t think about that. Yeah, go buy a ticket show up. And, and, and I think the other thing is, is while we’re looking at that, we also have to go, and this is, this is one thing I’m excited about with the my foundation, which is it’s called 261 fearless and we thought we were going to ask you about that. So perfect timing, bring it on up because we really have to reach women, girls and women, um, who are afraid to take that first step and not, not just a woman who is actually behind Burka in north Africa or something, but she could be your next door neighbor. She needs to understand that she needs to get out there and move. And this is good. Part of this podcast of, of aging and taking care of your health in just simple movement is, is so empowering but it is also so health giving and, and the woman in the family almost always dictates the health of the family and she becomes a role model also for her kids. A bad role model or a good role model when kids are growing up. Now we’re into our second generation of kids growing up and say, see, mommy run. She’s out there in the morning, you know, boom, she’s out there for 20 minutes, a half an hour. She comes in, yes, breakfast gets the kids off to school and then she goes to work. Um, I mean that’s quite incredible and it just fits into the family lifestyle. 27:24 These kids see that and they grow up saying, hey, yeah, that’s, that’s, you know, my mom. But they did. It’s just what they do. And, and my mom demands her time equally, but a lot of women can’t do that yet. Yeah. They just, they just need to be shown. How, so, um, hopefully my foundation 261 fearless is making a major contribution to that as named after that infamous bib number. 27:47 And to that point, you’re at, you, you ran the Boston marathon again in 2008, the anniversary at age 70, 70, 70. Yeah. And then they retired your number. 28:01 Yeah. Yeah. Isn’t that amazing? 28:03 That is so amazing. Yeah, they was tired. I was so honored with that. But a couple of things happen. First of all, uh, running 50 years later, it was the first woman to ever do that or to run a marathon 50 years after the first one. 28:17 Now that’s not a tribute to me. What, what it is, is just showing you how few women ran 50 years ago. All right. Yeah. And, and but what it also showed is that I was very, very grateful for my health. Anybody can get sick, anybody can be in a car accident. Okay. I was very lucky to dodge a lot of bullets. Uh, I was also extremely lucky to have such support over these last few years of people really believing in me. And then to come across that finish line on a pretty good time, actually like 20 minutes slower than I did, you know, at 1967. It was great. And that stopped 13 times and did eight interviews and 2017. Um, so, so the health is good and it is that, that’s the first thing that I thought of that cross the finish line. I am so grateful for my health, but also people. And I said, but everybody’s got to hear this message. I’m not obsessive about it. I mean, I think people think, oh well she’s a marathon runner. She’s obsessive. I mean, I only run every other day and do some core work at home. I don’t belong to a gym. I stretch. That’s it. Yeah. And I worked, I worked my buns off on everything else and, and I’m thinking if, if any, everybody could simply take every other day or every day, a half an hour just to go out for a walk or jog. They’re going to improve their health enormously. 29:42 Another funny story, I crossed the finish line a few hours later, I was approached by, um, Humana, you know, the very big health and wellness and they said, listen, this was spectacular. This is who we are. We would really love you to be a health ambassador for us on active aging. And I said, I’m not old. They laughed. They said, well, you’re 70 so you’re definitely a senior. And I said, I guess I am. I thought I was 25 and they said, you know what? That’s what we want to hear. I mean it’s a joy to spend to to talk about this message now just so many years and let them know, hey, you know, I’m a normal person, but basically I just go out and put one foot in front of the other. 30:24 And that’s, that’s one of the things we see about moving it. He don’t have to go out and run a marathon everyday. It’s just a matter of getting out and doing something. And it’s, and it is absolutely backed by science. All of the five daily actions that we advocate are backed by science. Not only to increase longevity but to improve overall happiness and your overall health. And exactly and, and moving is one of those things that that, and I can just, you know, your disposition is something that is radiant. It’s, it shows that you are a very happy and optimistic and positive ager and that is something that also comes about from moving. You know that there is a, I’m sure that you and, and whether it’s the, the endorphins or a runner’s high, whatever you want to call it. There is science that backs up that getting out and moving every day does things for you mentally just as well as physically. 31:21 The stats are just incredible. You’re absolutely right. And for me, my running has been my go to thing in terms of busting stress, getting better sleep, getting through divorce, the death of my parents, the loss of a job, whatever. All those things running has gotten me through because you work it out. Um, and also it’s been my creative source., you know, if I’m, if I’m having a tough time with an article or a opening for a TV show, I can’t get that open. I just go out there, run, it comes in 10 minutes, you just, the brain works in that way. 31:53 We actually spoke about this in another podcast where they did a study of people and they had to write things down and they sent one group out for a walk and then when he come back in the group who come out, who had gone for a walk had so much more written down than the group who hadn’t. And they simply had gone for a walk. You know, so again, it’s just that it just opened your mind and kinda get the juices going? 32:20 Absolutely. Absolutely. And um, you know, it’s just, it gives you a sense of, as we said earlier, optimism. Like you say, Oh gosh, I’ll never get this done, or that’s really bad thing happened to me. It gives you hope. Okay. That’s a great feeling. It’s, it’s really great. The science also is great in terms of runners, there’s that incredible study, started by the great gerontologist Wally Bortz at Stanford University and carried on now by his colleagues, um, where they track these, uh, faculty, people who ran against those who were sedentary. And the average lifespan was seven years longer for those who ran. But the mental attitude was 14 years younger. So it’s that, it’s that sense of can do optimism. And as Wally pointed out, he’s such a great guy. Here’s one of the greatest quotes he said, as we age, the most important organ in our bodies, there’s not our heart, our brains, but our legs. Because if we can keep moving, we keep our, our balance, we have less falls because that’s a huge source of it, Old Age death. Um, we, we keep the blood circulating in the oxygen and the brain. He said that’s the most important thing. And uh, I just, I just love him for saying that. I just think he’s spot on. 33:37 Yeah. So tell us a little bit more you that you mentioned it. I just want to make sure that people can find it and learn more about it because I think that a lot of women have, no matter what age they are, are still looking for opportunities that for encouragement and defined, uh, you know, an activity, like running support system. Sure. So 261 fearless. 33:59 Yes. 261 fearless is an educational communication and a club network of women around the world where we show you how to take the first step and to, to run. Even if you, even if you’re a marathoner, it is not competitive. Is social running, walking of women coming together and it’s nonjudgmental. I think that’s the biggest thing where you for one hour a week, get away from all the stuff in your life and go out and meet your mates, um, and, and, and, and move together. And you share that dynamic. It’s, it sounds so simple, but it’s very true. But the coaches themselves are trained in how to create a nonjudgmental group and also how to move properly. It’s not like brain surgery, but we do want people to be trained properly. Basically, we want you to run the rest of your life healthily and safely. And we want to find this community. And so, you know, this isn’t for you. If you want to be a competitive marathon runner or make the Olympic team, this is for you. If you are looking for a network of women. More importantly, there are women like you guys and me, who, who want to pay back, who, who have gained so much from this experience. We want to show somebody else how to do it. And we currently have a campaign, um, and on, and you can find more about it on our website, which is 261fearless.org 261fearless.org I’ll tell her she can, it is so simple. Tell us she can do that and show her how. Yeah. Oh, that’s awesome. We’d love to have you create a club and network and join the network. We’re in amazing places. Also, we’ve just added Democratic Republic of Congo. We have Albania and we also have some Syrian refugee women in Vienna, Austria, as well as just wonderful little clubs in Boston and Washington DC and Chicago of ordinary women like us. 36:00 Yeah. Fantastic. Yeah. Well we will definitely link that in our show notes as well. The 261 fearless. We’ll definitely link your main website, which is just Katherineswitzer.com am I right or marathonwoman.com either marathonwoman.com perfect. Yes. Where people can find your books, marathon woman running and walking for women over 40 which is a great eBook. I’m sure other people will be could. Definitely get some information out of that. And then your nonprofit 261fearless.com I mean.org sorry. dot org got it. Yeah. Yup. We just cannot, I mean, what a, what a fantastic story. What a fantastic uh, example. Like I said, whether I’m looking backwards at the things you’ve accomplished historically or just the bright shining spot you are today. Uh, it’s really just awesome. It’s Super Fun. So much fun to talk to you. So much fun to learn more about your story and really it’s very inspirational. Yeah. 37:00 So thank you Molly, and thank you Angela. I’ve enjoyed it. There’s so much with you. And just final word for everybody out there. Keep moving. 37:07 Yes, please. Yes, Katherine. Have a great Day. Appreciate it so much. Yeah. 37:12 Thanks guys. Good luck with the show. Take care. Thanks for listening to the live happier, longer podcast. Now it’s time to move, learn, share, and let go. Five daily actions to make the rest of your life the best of your life. See you next week. 37:34 Okay, so just a quick word before you go, if you haven’t already clicked that subscribe button on our podcast. We would love you to do that and we would also appreciate any feedback you have for us. Positive ones would be excellent. What will take anything you have to say and for a free copy of the Five for life planner head to fiveforlifeplanner.com and download your free PDF today.